From left to right: Ben & Jerry's activism head Chris Miller, Rep. John Lewis of Georgia, Ben & Jerry's CEO Jostein Solheim, Board Chairman Jeff Furman, and board member Daryn Dodson. Ben & Jerry's is making a "major, multi-year commitment" to the movements for voting rights and racial equality, said Chris Miller, who manages the company's activism programs. The initiative, still in planning stages, should burnish the company's reputation for attacking the social problems most large corporations avoid. 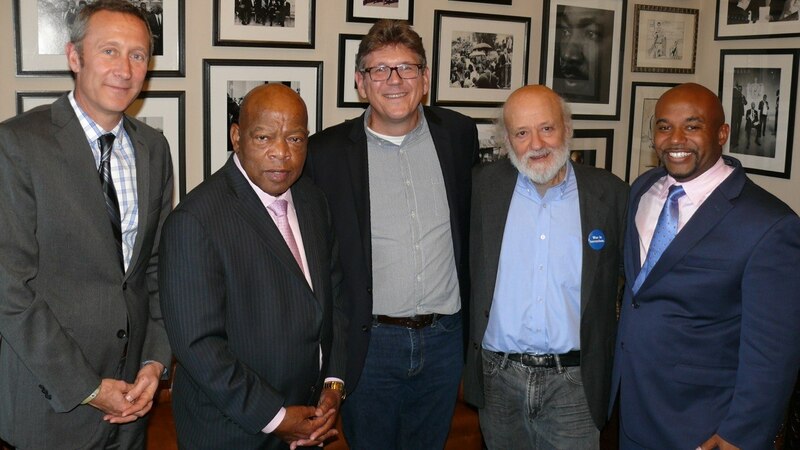 Last week, U.S. Rep. John Lewis (D-Ga.) spent 90 minutes advising a group that included Miller; Ben & Jerry's CEO Jostein Solheim; Board Chairman Jeff Furman; and board member, Daryn Dodson. This weekend, Miller, Furman, company co-founder Jerry Greenfield, and several employees will travel to North Carolina for a "learning journey" sponsored by the Ben & Jerry's Foundation. The Vermonters plan to meet with activists like Nelson and Joyce Johnson, co-founders of the Greensboro, North Carolina, Truth and Reconciliation Commission, and the Rev. William Barber, a leader of the legal challenge to a Voter ID law passed by the state legislature that eliminates same-day registration, bans out-of-precinct voting, restricts early voting, and requires a photo ID before casting a final ballot. The Ben & Jerry's Foundation is independent of the ice cream company, which has been owned by Unilever since 2000. The foundation occasionally sends company employees, who make all of its grant decisions, on fact-finding trips. In 2014, for example, employees toured the U.S.- Mexico border. Furman and Greenfield are Foundation trustees. "Ordinarily I wouldn't go on a learning journey," said Miller, "but the company has decided to focus on the confluence of money and politics, voting rights and the larger issues of racial equality, because our democracy only works if it works for everybody. "When you have massively wealthy individuals funding organized efforts to keep people from voting, it's a bit of a crisis," he continued. "Ben & Jerry's has made major commitments to climate change and the labeling of GMOs. It's at least as urgent to get big money out of politics while getting more people in." Miller says that the company will probably settle on specific voting rights and racial equality campaigns around the end of the year. He adds that Ben & Jerry's plans to "put a lot of effort" into the 2016 election cycle. Brad Edmondson is the author of Ice Cream Social, which tells the story of Ben & Jerry's social mission.